We each go through distinct experiences during our childhood. Experiences that mold and impress upon us memories that we unconsciously collect. No matter what walk of life, we all relate to similar emotional experiences during our early years. As children, our innocence allows us to encounter these emotions in its purest form. For example, the bliss felt when we watch our favorite cartoon show. At that moment, nothing else matters in the world. This feeling continues until one grows up and then reality sets in. As adults, we live in the real world while clinging on to that profound happines. Adulthood bears many burdens of the real world. We worry about ourselves, our families, and our security to name a few. Anxiously agonizing over our responsibilities has become the norm. We contemplate on what our futures hold. More often than not, the emotional rollercoaster of life torments adulthood. Tiongson says "I can no longer laugh the same way I used to as a child". His art reminds him of days when ignorance was bliss. He strives to capture and share those moments in his childhood where he genuinely belly laughed his face off without a care in the world. He digs into his childhood memories and reflects it in his art today. For him it is the bliss of play which he holds on to that fuels his creativity. He grew up exposed to 90's toys, cartoons, comics, computer games, movies, and Japanese pop culture. Tiongson thinks of himself as child-like in a sense that he yearns to feel the bliss of childhood. To cope with chasing that fleeting feeling, he surrounds himself with his aesthetics growing up. The immersion into cartoons, toys, music and play are what fills his void. This in turnis used as energy for creative output. His art practice is a journey of nostalgia. 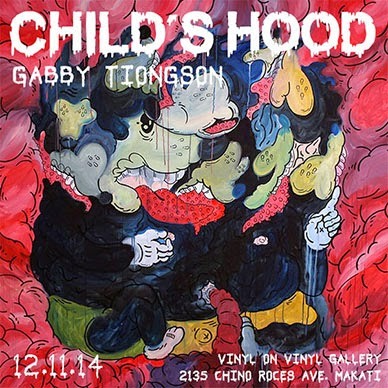 Tiongson creates characters that are reminiscent of his childhood but done in a corrupted manner. Whether he consciously or unconsciously does it, it is his way of finding Never land. He is searching for his child's hood that was all about enjoying the moment, an escape to a world wherein there are no bills to pay, no government to worry about, nor a supervirus to beat. He believes that it is his life's purpose to rediscover the bliss, that loss of innocence, and share it with his audience.